General Washington has no money to pay his discouraged troops and twins Sally and Roger are asked by their father, General Priestly, to help hide a shipment of gold which will be used to pay the American soldiers. Unfortunately, British spies have also learned about the gold and will stop at nothing to prevent it from reaching General Washington. Based on a true story, this is a thrilling episode from our nation’s history! Lucy Fitch Perkins (1865-1937), was a popular American children’s author and illustrator in the early 1900’s. 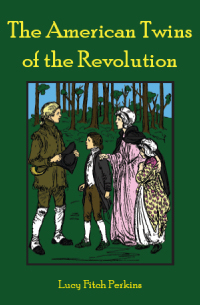 "My son, Josiah, is reading [The American Twins of the Revolution]. He is absolutely enthralled with it. It's a historical fiction and he loves history. What a better way to introduce him to history than a good engaging story?" ~ Zindra N.